Tomorrow the kids in kindergarten are having an end of year celebration. They have ponies and other animals coming to visit for rides thanks to the school PTA. This will be also be to culminate their transportation unit. Parents have all been invited to come for the fun. After the rides there will be a pizza lunch. We were asked to sign up if we are coming and also let them know what we could bring. I told NHL’s teachers to let me know what they needed the days before. Yesterday when I picked NHL up from school I was told that they had plenty of paper products and drinks. She asked me to bring in a dessert item. Immediately I started to think about things. Cupcake cones would be fabulous, but it may be for both classes and all of the extra adults. That would be too hard to bring. Then I thought about making bonbon cookies like my friend J’s mother used to always make. These are easy to make, but very time consuming and not inexpensive thanks to the Hershey kiss filling. Of course I asked my Twitter followers for suggestions. Lots of great ideas came in. Then I had an idea. What about making something from Bakerella? Some of these items were already on hand at home. I wanted to have the lollipop sticks just in case I try to make those. I think they may be a little more work than I have time for (especially on my first attempt). There is also the worry about how to take them to school if I have them in pop form. 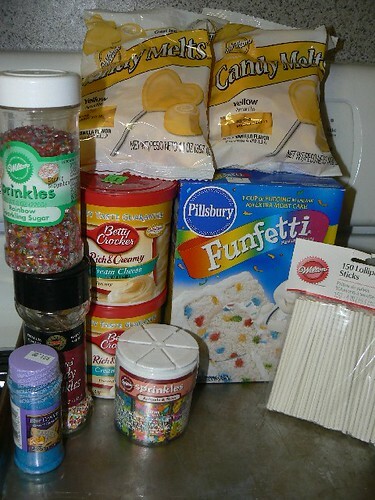 In addition to this, I have since changed my mind on the frosting that I am going to mix with the cake. I had planned on using the cream cheese kind seen above, but now I think I am going to use the Rainbow Chip by Betty Crocker. I think that will be more fun for the kids. On the outside I have the yellow melting chocolate and a variety of sprinkles. I had thought about the blue ones to make it the school colors, but will see what NHL thinks when he helps me contruct them later on. On that note I am off to check the two cakes. Both of them are now baked and cooling. Will update later with more photos of my experiment a la Bakerella. Oh, if you have time check out Bakerella’s fabulous collection of special cake pops. – amazing! YUMMY…wish I lived closer, I would taste test them for you!!!! You’re so lucky to be able to bring homemade items. We can only bring store bought treats to school. Can’t wait to see the results!